We don’t get hung up on one large crop or a flat shipment market, but rather look to what opportunities we have to control our own destiny through appealing to the next-generation consumer and continually adjusting our supply base to best match demand of the future. There is strong evidence that the 2018 winegrape crop will go down as a record on the production side. 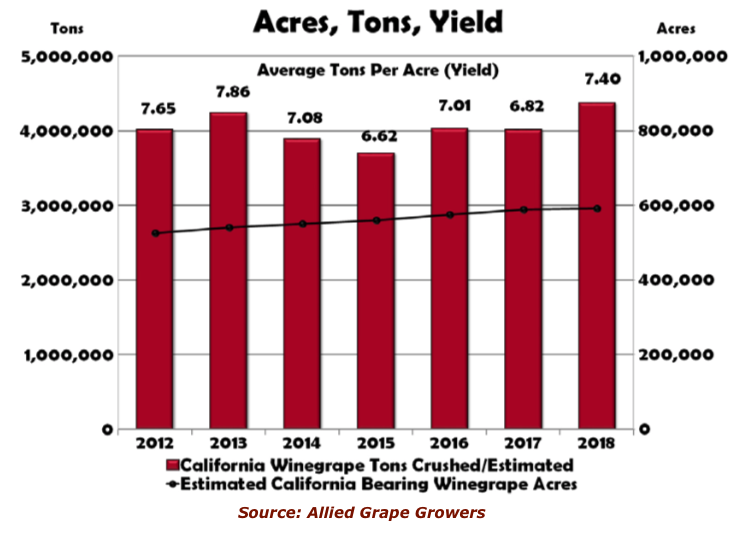 While the Central Valley probably experienced an average-sized crop overall, the northern interior and coastal regions of California burgeoned with supply. 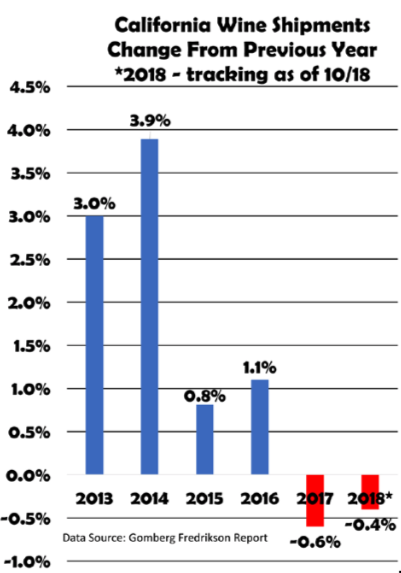 This growth in production was due to two things: increased yields and increased bearing acreage in those regions. 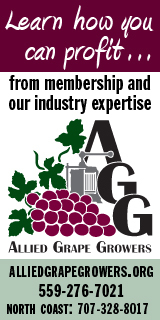 AGG is estimating that up to 4.4 million tons of California winegrapes may have been crushed in 2018. On top of California’s ample winegrape crop, recent reports by the International Office of Vine and Wine (OIV) conclude that global 2018 wine production will be near the largest in the last two decades, estimated to be up a whopping 14 percent from 2017. Evaluating the situation on the surface, it may seem we have entered into a period of market imbalance, with excess supply. Our production in recent years has been very flat, even considering the fluctuations experienced via annual yields. We have crushed right at four million tons of winegrapes per year, since 2012. Spinning this into a positive, we can say that this contributes to the very slowdown in shipment growth about which we are concerned. Isn’t it impossible to ship more wine over time if we aren’t producing more grapes? Additionally, we should be tempted to recognize that a supply imbalance can be easily corrected with a short crop, particularly when there is no evidence that bearing acreage will increase in the future. But on the demand side there are longer-term demographic and cohort issues that we need to understand, not only to properly forecast the behavior of, but also appeal to, the next generation of consumers (the millennial generation). How do these dynamics establish the setting for the 2019 crop? Certainly, we have areas of ample supply in the wine industry. And the reality that global supply is large doesn’t help the situation. Structurally, we have grown premium supply (via vineyard plantings) in accordance with a growing market since 2010 and have decreased supply in the value segments in accordance with shifting demand. We really aren’t all that far from “balance,” although anytime you are out of balance, it feels uncomfortable. One thing that we will say for certain, and hopefully with convincing passion, is that struggling vineyards have no place in the future of this highly competitive business. A struggling vineyard is one that is production- challenged in areas where production is necessary for survival (i.e. the interior). It is also a vineyard that is challenged to achieve proper color (for red grapes) and/or brix requirements to produce quality wine. There are many virus-affected vineyards statewide that fall into this category and need to be seriously evaluated for their ongoing sustainability. Lastly, a struggling vineyard may be one that is overly dependent upon hand labor for its survival, like non-trellised vines in lower value regions. The plea with which we want to leave folks in the industry, is to not panic amidst some slightly changing supply/demand dynamics. Things could be much worse than having a flat shipment period or slightly elevated inventories. Those things have a tendency to correct themselves rather automatically with increased vineyard removals and sudden changes in crop size. Again, this is especially true since we forecast no real growth in bearing California winegrape acreage. The longer-term issues should be of greater concern. What are we doing to appeal to the next- generation consumer? 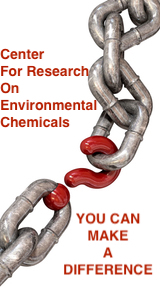 What are we doing to assure long-term viability and sustainability of California agriculture? What are we doing to understand (via research) how we can maintain a competitive advantage in production and winemaking, assuming we have one?